Is Hillary’s past haunting her future? Tonight on Crossfire, brand new documents reveal Hillary Clinton’s private reaction to her husband's cheating scandal with Monica Lewinsky. 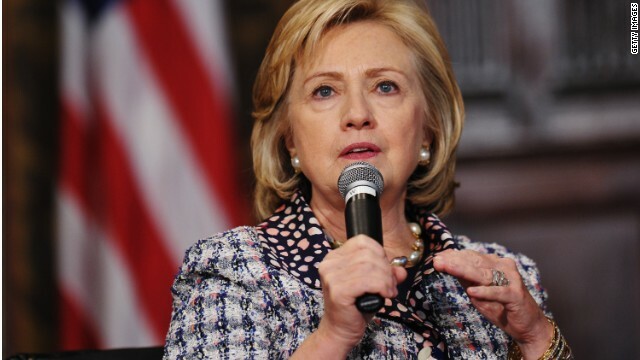 Can Hillary overcome the inevitable talk about her past if she’s looking for a run in 2016? At 6:30pm ET Tracy Sefl, Senior Adviser to "Ready for Hillary" and Tim Miller, who leads an anti-Hillary effort, join Van Jones and Kevin Madden. We want you to weigh in on tonight’s Fireback question: Should Hillary Clinton run for President in 2016? Poke a fork on BHillary. She is already done. Her past has not even begun to be exposed yet. Just wait. She does not have the cover that 0bama had in that no one knew or even could find much on him. BHillary has decades of baggage which little of it has yet to be brought out to the public in any detail. Even the liberal MSM will have to cover stories. Rand Paul has nothing. Thus he has to drag up the past. Hillary is way up in the polls, while he is near the bottom , where he belongs. I certainly hope so. If not, we have an electorate totally incapable of independent thought. If that's the case we are doomed. In no way should her HUSBAND's indiscretion weigh on her political life. She did not violate the marital trust, he did. Stop punishing the wife for the sins of the husband! I, personally, believe she choice to stay with him because a divorced woman can not, yet, be elected president. Her choices are ALL about HER power, not the country's welfare. Meanwhile you FOOLS on both sides keep taking sides like it's a stupid football game and fighting with each other. You are all Americans and you treat each other like the enemy while the rich Democrat and Republican politicans go to the bars together after work and laugh at how dumb and gullible you are. You people are being played for fools by both sides and you don't even realize it. Wake up, both parties are nothing but lying scumbags. Not nearly as much as it would...if voters really knew her past. But today's politicians write and rewrite their histories as "living documents." When Hillary was running for President there was a poll that 51 percent would not vote for Hillary under any circumstances. Wonder if anybody has changed their mind? I, for one, am more resolute than ever. That woman is self-absorbed, ruthless, self-entitled, anything but a public servant. Several witnesses who were at Fort Marcy Park reported that Mr. Foster's car was not in the Fort Marcy lot when Mr. Foster was already dead. Others, when showed the photographs of Mr. Foster's body at the park, reported that the crime scene had been tampered with. Hillary is as hated by conservatives as Sarah Palin is by liberals. It isn't clear why in either case, but the chances of any kind of piece or progress with either as President are minimal. It isn't clear why? Republicans hate Democrats. Democrats hate Republicans. I hope that cleared it up. Sounds like the Teapublicans are really, really afraid of Hillary. Which is exactly why she should run. She would just about sweep the women's vote, the gay vote, the black vote, the Latino vote the youth vote and the anyone with brains vote. That is only a small part of what is to be brought to light. Firstly, if that is all she called Monica then I would say Monica got off easy. We have all heard 'the other woman' called a lot worse. Secondly, who keeps such detailed records of conversations with a friend. Public figure yes, but friend first. Imagine if all of your private thoughts became public. If anything, I think more of Hillary for withstanding this invasion of her privacy. No wonder public figures mistrust people. I would never betray a friend's trust by recording her thoughts. Oh my goodness! The republicans are shaking in their boots and guess what they are going to try to build into a election issue? Of course! Hillary. Hmmm, what can we possibly bring up that could hurt her somehow if she runs for president. She has so much positive energy around her and the demos all want her to run, what can we do to stop this machine????? Oh yeah, lets go to the Lewinsky/Bill debacle. Yeah! That should get everyone thinking. Do these clowns realize that those of us struggling daily because of the GW years and him skewering our economy, do they really think the Lewinsky thing is even relevant? Come on, dust off your beanies and come up with something more current. This is extremely irrelevant. Stupid old guy driven Republican party. So she out sourced some of her home responsibilities. What is the big deal. You know, her reaction to her bimbo husband isn't much of an issue. If you want something legitimate from her past to haunt her, why not bring up the way she ran the health care reform initiative? Totally opaque plan creation, no one allowed any input, and then a final "my way or the highway" plan thrown over the wall at the end. This is a legitimate cause for concern about any "leadership" qualities she might possess. No concerned here. No Republican would have ever agreed to work with Democrats to reform health care. My way or the highway? More like their way or it will never get done. It's no secret that Republicans have stonewalled everything in the past four years. Of course you guys are going to attack Hillary with everything you can muster. You guys are going to try to convince America that Hillary is Satan. The Republican Party has even begun making fake web sites of Democrat politicians. I am interested what a party is going to do for America, not how well they can attack the other side. I don't believe the Republican party has any plans to reform health care other than destroying Obamacare. They complain that Obama doubled the debt trying fight off the recession. Bush doubled the debt during a good economy and NO Republican cared in the slightest. Republicans complain that Obama didn't repair the damage from the recession fast enough. They never even cared that Bush destroyed the economy in the first place. Republicans complain that Obama lied and people lost their insurance and had to get new insurance. Bush lied and hundreds of thousands died as a result and the Republican response was to reelect Bush. Republicans are desperate bringing up monica lowinsky and trying for a wedge issue now that Hillary is way up in the polls and Christie has sunk! Rand Paul and the republicans are going no place quick! I dont believe our nation needs the clintons and their history in the white house, Bill was having affairs with interns and Hillary hiding from their past ghosts in real estate transactions and law partners. New blood with new ideas, definitely a woman, but one with integrity and wanting to serve the people, not themselves. The problem in trying to elect good leaders for The United States of America has nothing to do with the color or gender of our politicians. It's our politician's, from both parties, lack of honesty and the lack of willingness to do right by the US citizens that they're elected by and should be representing. Before Hillary Clinton runs for president, Americans need to remember that it was her "husband" that got us into bed with China in the first place. – How's that been working us? And what about that whole White-Water/Vince Foster deal? I don't trust the Clintons at all. Nixon restored normal diplomatic relations between the US and China, but Clinton is the one who opened up the trade floodgates with China. And both Bill and Hillary were actively involved during their visit to China. Under Clinton jobs to China, Under Bush I & II influx of illegals/cheap labor into the US and jobs to Mexico/NAFTA – Bush started it and it was signed into effect by Clinton. I loved President Reagan at that time, because he brought pride and respect back to our country after those embarrassingly weak Carter years, but unfortunately his shortsighted economic policy sent us down the wrong path. Reaganonomics was a huge mistake. Jeez and the wizards on Wall Street wonder why the American people aren't putting as much money into savings and their 401k plans anymore. Maybe it's because the shortsighted economic policies, from the 1980's to the present, have come back to bite the hands that feed them. I guess the thought of changing from a manufacturing based economy to a service based economy of smoke and mirrors is working out just great? – Not! But even now President Obama is pushing a new disastrous, job-killing, "free trade" agreement on the United States under the misleading guise of increasing export opportunities. The president is asking for fast track trade authority that would give him unchallenged authority to do whatever he wants, in most cases to satisfy his campaign contributors instead of the American people. His track record proves he cannot be trusted with this kind of power. Congress must vote to deny the president fast track authority and they must refuse to pass the TPP! The president claims this agreement will be a good thing. In fact, the scarce details emerging from negotiations point in the opposite direction. Hundreds of corporate advisers are at the table looking for handouts for their particular industries, while average Americans are largely left in the dark. The results will surely be disastrous. If they try sneaking another disastrous trade agreement, like this TPP deal, through they're true Traitors to the American people. And I'll bet both parties will be involved. Funny, they can work together to line their own pockets, but not to put protections in place to help the American citizens that they are supposed to represent. The Trans Pacific Partnership must be stopped before it buries us for good. The WTO and NAFTA have done enough damage already, but if this goes into effect, Americans are really screwed. Let's face it – Both parties have sold out the American People! – Neither party really controls our country. If Ross Perot had been elected president in 1992, the American people and the real American economy would have been much better off today! I and many other people, who were able to see through all of the left vs right BS, did vote for Perot, because he was straight forward and just used common sense. He cared about his country and the American people. If the best the Republicans can do now day's is Hillary's past, they are indeed in deep dodo's.